A move-in condition space is a property available for immediate occupancy. A property must comply with all requirements by any governing municipality for a habitable dwelling. Requirements for habitable dwellings are operable plumbing, windows, electricity, and lockable doors. The requirements vary from place to place and available at the designated city department. 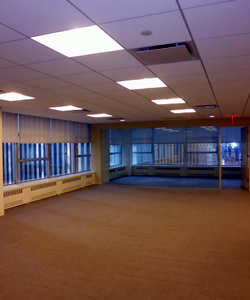 Built-Out: There are existing tenant improvements allowing immediate occupancy by a tenant. Move-In: Allows tenants to occupy the space without any modifications and considered built-out. Shell: Typically not built-out and unimproved prior to occupancy. The space is newly completed and never occupied by a tenant. 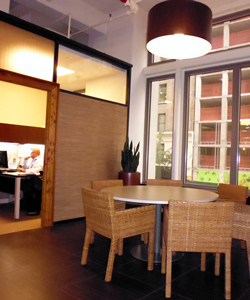 The location of the office space is important for your business. Is the space fitting for the current and future business growth? Does the space fit your business? Is there enough private offices, collaborative work areas, and storage? Is traffic congestion a concern? Are the commuting needs of employees being addressed? Are the appropriate communication services available? Are the appropriate internet services (T-1 lines, DSL, or cable modem) available? This checklist is a starting point and by no means complete. You may choose to find other completed checklists on the Internet or reference books. You may also contact us to cover any issues you need addressed. We can assist in easing the process and fill in any blanks. Furniture & Phones: By this statement the space can provide Furniture & Phones optionally if the tenant requires - this of course allows you to keep up momentum while transitioning to your new space. Remodeled: This space feature indicates that the unit or property has been fully constructed towards a superior asthetic; moreover there could be improvements made to the underlying infrastructure as well - understand though that each space is handled on a individual basis so standards may differ. Most businesses search for the standard office specifications; in some cases, the standard does not suit everyone. Be sure to discuss this with a professional Broker who can assist you in the process. Do note that our Brokers are available to help you find the best space for your business, we do no work for any property owner and put your interests first above all else. We can help guide you and locate the ideal office space for you - at NO OBLIGATION OR FEE; there is no fee to you the tenent in commercial real estate.